Should Russia build its own top attack ATGM? LAHAT and KSTAM seems to be superior to the tank-used ATGMs Russia currently has. Don't know much about Sprinter for Armata, though. So, what do you guys think? If tanks are going to be used for long range indirect fire on a regular basis, then I would recommend an unassisted top attack shell with a laser seeker like Kitolov-2M and GRAN. A 125mm HE warhead with a delay fuze should be more than enough to deal with the roof armour of any modern tank in service. Re: ATGM for Russian tanks. Interlinked wrote: If tanks are going to be used for long range indirect fire on a regular basis, then I would recommend an unassisted top attack shell with a laser seeker like Kitolov-2M and GRAN. A 125mm HE warhead with a delay fuze should be more than enough to deal with the roof armour of any modern tank in service. These toys are 120mm. Most Russian tanks use 125mm canon. The most modern ATGM they can use for now is Reflex-M, which kinda inferior to LAHAT, though. I don't know much about Sprinter, btw. Only in the case of 152mm version of T-14, Russian tanks gonna have major superiority against LAHAT and KSTAM, thanks to the ability to use Kornet-1D and Krasnopol-M. But, it seems to me, that a new modification of Reflex should be developed for T-72B3, T-90M and T-80BVM as a response to LAHAT as well. What is the advantage of increasing the direct fire range of anti-tank missiles beyond what has already been achieved with Refleks and Svir? What are the chances of a T-80VBM seeing and identifying a tank-type target at 8 km in Central Europe? Interlinked wrote: What is the advantage of increasing the direct fire range of anti-tank missiles beyond what has already been achieved with Refleks and Svir? What are the chances of a T-80VBM seeing and identifying a tank-type target at 8 km in Central Europe? Tank should be suitable not only for european terrain IMHO. It should be functional in all hypothetical scenarios I think. The problem idoes not merely concern terrain obstacles, but also the weather conditions and the magnification capabilities of the sighting system. Even if a T-80BVM were sitting atop a hill in Syria and looking out into never ending plains, the weather is probably not good enough for the crew to see a tank-sized target at 8 km, not to mention the fact that Russian thermal imaging optics have very limited digital zoom capabilities. Sosna-U only has 3x optical zoom (day channel) and 6x digital zoom (thermal vision channel). That's very, very bad. Contemporary Western FLIR sights have more than 20x digital magnification. Plus, you can't identify a tank from a truck or even a decently sized diesel generator at 8 km with a high magnification thermal imager, especially if the target is a NATO tank and is wearing Barracuda thermoptic camouflage. Because of this, the long range of LAHAT can only be exploited by forward observers equipped with a laser designator, not by the tank alone. The tank firing the LAHAT would be doing so in an indirect fire mode, not in direct fire, and that's why I said "If tanks are going to be used for long range indirect fire on a regular basis, then I would recommend an unassisted top attack shell with a laser seeker like Kitolov-2M and GRAN." It's simply not feasible any other way. 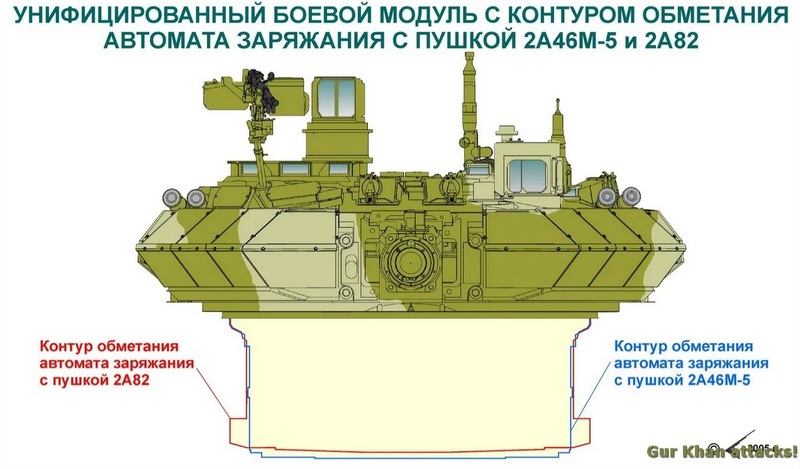 The problem of armor-piercing shells "Vacuum"
how to cram in "about the problems of the modernization of Russian tanks under the new 125-mm tank gun 2A82 and the armor-piercing sabot projectile (BPS) developed for it new generation of OCD "Vacuum". 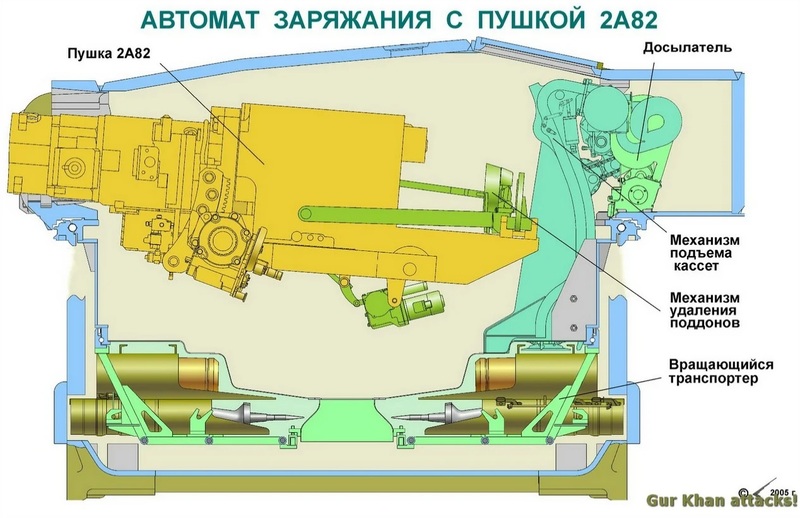 The Russian tank super-cannon 2A82, which is now installed in the T-14 Armata tank with minor changes, was originally conceived and developed for a different purpose - the modernization of the numerous fleet of T-72 and T-80 tanks and, first and foremost, to equip the new modifications T-90 tank. A feature of the new gun was the ability to use new, longer armor-piercing sabots with enhanced armor penetration. But here's the bad luck ... BPS, developed by them for the topic "Vacuum" had a length of 900 mm. That is, they were guaranteed not to fit into the shops of standard automata and loading mechanisms. How did the Russian designers solve such a problem? Tank T-90 with AZ "horizontal" type. From the KBTM patent, Omsk (c) Gur Khan attacks! The first and most obvious option is the abandonment of the existing “autoloader” constructions with the transition to a new type of automatic loader - the so-called “horizontal” one. In it, the shells (mainly BPS) are located horizontally in the conveyor, attached to the aft part of the tower. At the same time, there is a technical possibility to leave the classic AZ transporter in the fighting compartment, filling it with cumulative high-explosive fragmentation ammunition and missiles. The result was a “double flow AZ”. "Double flow" AZ in which the "long" BPS are located horizontally in the zabashchenny compartment. PeS patent KBTM, Omsk (c) Gur Khan attacks! 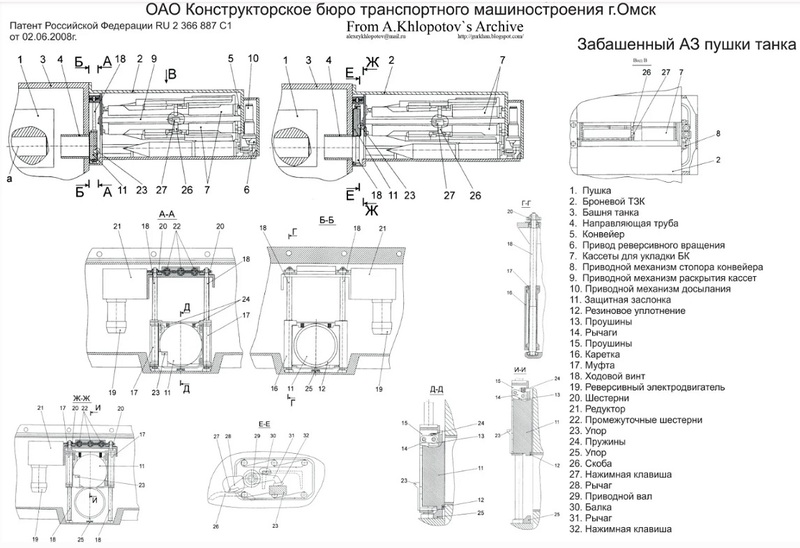 Back in the 1990s, designers from the Omsk Design Bureau, which previously specialized in engineering and auxiliary equipment and accompanying the serial production of the T-80U tank at the local Transmash, seized upon this idea. In 2005, the decision with the AZ of the “horizontal” type formed the basis of the ROC Burlak. "Frenched" AZ "horizontal" type, developed in the framework of the ROC "Burlak" (c) Gur Khan attacks! We will tell about this interesting work some other time, but for now we note that not everything obvious is rational. In practice, the unified combat compartment with the new AZ was very difficult and unreliable. It greatly changed the location of the center of gravity of the tank, which affected the driving and maneuvering capabilities. In an amicable way, it also required the lengthening of machines when upgrading to seven rollers on board. Controversial were the issues of protection of zabashny AZ But the main thing is the extremely high novelty of the structure, which leads to an increase in labor costs, cost, and, again, the reliability of the structure as a whole. In general, in 2009, this topic was hacked. Modernization of the MZ "kabinnyh" type, which stood on the T-64 and T-80 immediately considered a hopeless occupation. Instead, the Russian “eighty” was planned to be equipped with “unified fighting units” or “unified fighting modules” of Omsk or Nizhny Tagil design. About how to cram Vacuum into Tagil AZ at various Internet-related forums, various “experts” and “amateurs” broke many copies. Meanwhile, the decision to which the Ural designers arrived during the ROC "Breakthrough-2" was simple and elegant, and, by the way, it was ideologically similar to what the Kharkiv team did at T-64A at that time - they also had MH in the case "just like that" did not want to get up. If BPS "Lead-1" and "Lead-2" having a length of 740mm, still fit into the classic AZ conveyor, then what needs to be done, what would the 900mm "Vacuum" enter? The difference in length between these ammunition: 900-740 = 160mm. And so much space needed to be found in the width of the fighting compartment of the tank, so that it would have entered a larger diameter conveyor. And now we recall that the thickness of the T-72B and T-90 in the BO region is 80 mm. 80 + 80 = 160, the most desired 160mm! The Urals simply made small cuts in the sides, covering them with the corresponding armor plates from the outside. Voila! Simple and elegant solution. In the same way, the frosts in Kharkiv milled the side of the T-64A in the area of ​​the Ministry of Health, and later did the stamping. Only on the T-64 and T-80 due to the fact that the munitions in the MOH were located vertically, this stamping had a very impressive size. In the case of the Tagil AZ, the lining turned out to be minimal, which can be clearly seen in the illustrations. Actually, the 2A82 gun got up instead of the 2A46M without any problems - all the landing dimensions and the mounting design were the same. To ensure firing with "Vacuum", the loading angle was increased to 12 °. What changes did AZ get? First of all, the conveyor belt was changed. Once again, the mechanism for lifting the cassettes and the rammer were changed. “Once again” - this is because before this, their design was changed under BPS L = 740mm. Then the cassette lifting bracket received a bend in the middle part and a number of corresponding changes, which made it possible to change the trajectory of the cassette with ammunition, without changing the design and dimensions of the tower itself. Now, for firing BPS L = 900mm, the cassette lifting mechanism bracket was made of a complex concave shape. This again changed the trajectory of recovery and allowed to fit into the existing dimensions of the fighting compartment. 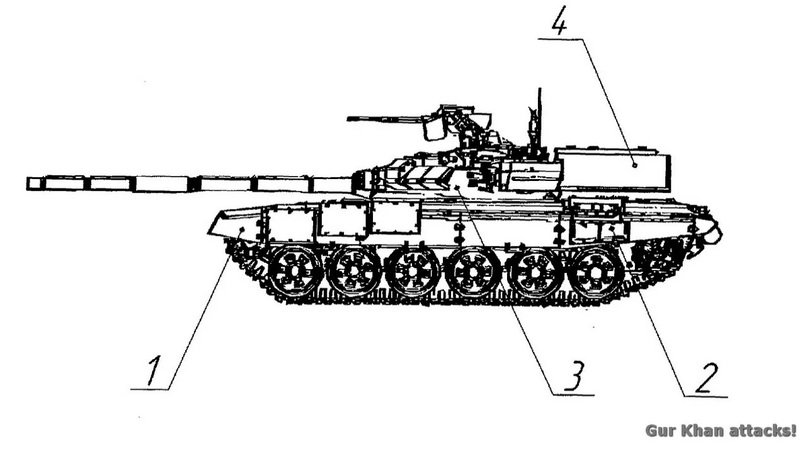 The developed combat module with a 2A82 cannon, with the above-described refinement of the tank hull, could easily get up in both the T-90 and T-72, and the upgraded T-80. But this did not happen in practice. With the modernization of Russian tanks, guns of the D-81 type are still used: 2A46M-4; 2A46M-5 and 2A46M-6. 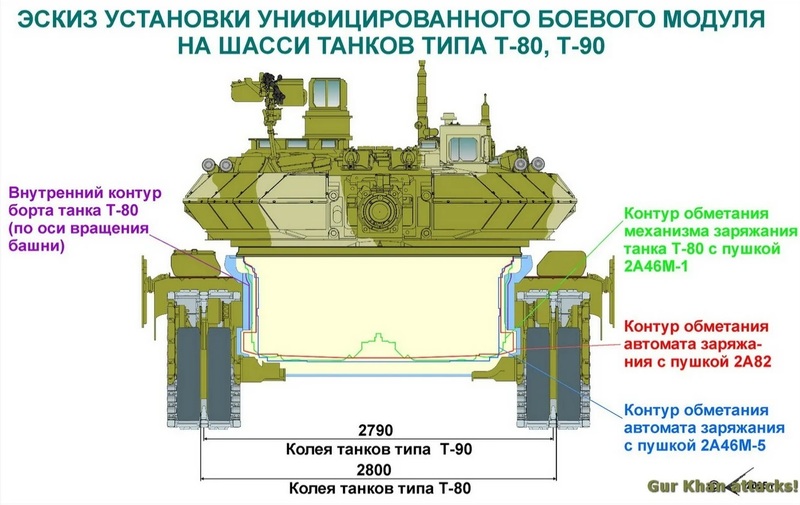 The 2A82 will not even be on the T-90M tank that is so awaited by the Russian army. Just because, as it turned out, our domestic industry does not know how to produce it. But, this is the topic of a future article. It is clear that Western type of ammunition storage is not acceptable in Russia, because that is a huge waste of material and weight... 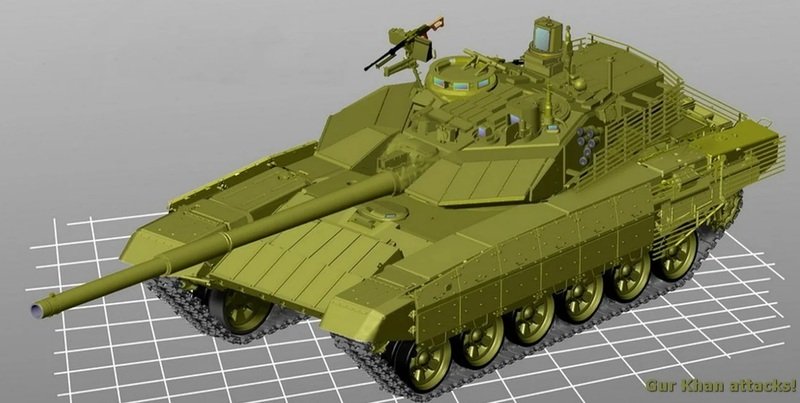 The West has to create an additional heavy box with thick armor for the ammo protection, while Russian design simply make use of existing hull armor. Of course it will be a different issue if the external ammo only contain APFSDS without any propellant, then extremely thick armor is not neccessary... but again it is impossible for old generation of Russian AP warhead, since it usually contain a portion of additional propellant, so that AP and HE warhead can use the same kinds of propellant without any adverse effect... then the solution here is a new softwares and sensors so that the autoloader can recoginze correct types of warheads and propellants and then T-90xxx can strip off propellant out of KE ammo as it like and an external storage full of APFSDS may be a potential choice to increase total ammo carried. But then, another problem here is if your customer desired NATO ammo but want a Soviet-type tanks, like T-84 Yatagan. A bulky, heavy external ammo is expected. The thing is that the long ammo we are talking about is a block of propellant with what equates to a needle sticking out the end... of course it is a 40mm plus diameter needle, but a needle shape nonetheless. I am surprised they didn't just adapt the centre of the autoloader so that the rounds in the autoloader can be angled slightly so their noses overlap allowing longer penetrators to be placed in the autoloader. It would require that they can flex down so they can be lifted out normally for loading... but would it really be that hard? Moving to a liquid propellent and just carrying projectiles without propellent would mean a rear turret bustle full of penetrators in sabots with no extra propellent would become safe and efficient way to store ammo. GarryB wrote: Moving to a liquid propellent and just carrying projectiles without propellent would mean a rear turret bustle full of penetrators in sabots with no extra propellent would become safe and efficient way to store ammo. Can we control the rate of burning when choosing liquid propellant ? As far as I know different kinds of warheads demand different rate of burning for the propellant. Propably by changing the mixture. 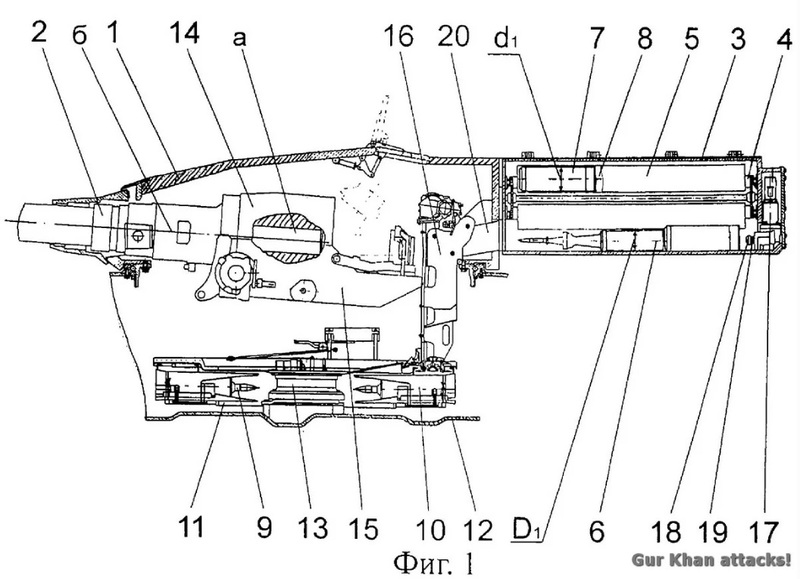 The 125mm main gun of current Russian tanks use a standard propellant stub for all rounds of ammo, and for the high velocity anti armour rounds there is extra propellant around the penetrator, while the lower velocity rounds (HE FRAG and HEAT) are just projectiles without extra propellant. As far as I know they all use the same propellent mixture, but the high velocity rounds use more propellant and a light projectile to achieve the high muzzle velocity, while the standard rounds are heavier and have no extra propellant except for the standard charge. For a liquid propellant charge weapon, the amount of propellant used could be infinitely variable depending on the target type, the target range, the air temperature, the ammo type and weight, even the barrel length of the gun being used. To enhance safety it would be ideal to split the propellant into two relatively inert liquids that can be stored separately inside the vehicle so if hit the material might be toxic and might burn but would not explode or burn violently if ignited. There was some mention that the propellant used for Coalition (152mm artillery) had to be microwaved to prepare it to be used as propellant, which would be an excellent safety feature and could perhaps improve mixing and make it clean burning. Note a carefully designed liquid could be designed so it burned completely and converted all the chemicals into gases and left no solid remnants to dirty the weapon, so it could be a totally clean burning propellant. Liquid propellant offers more powerful reactions than solid propellant or gas based propellant.